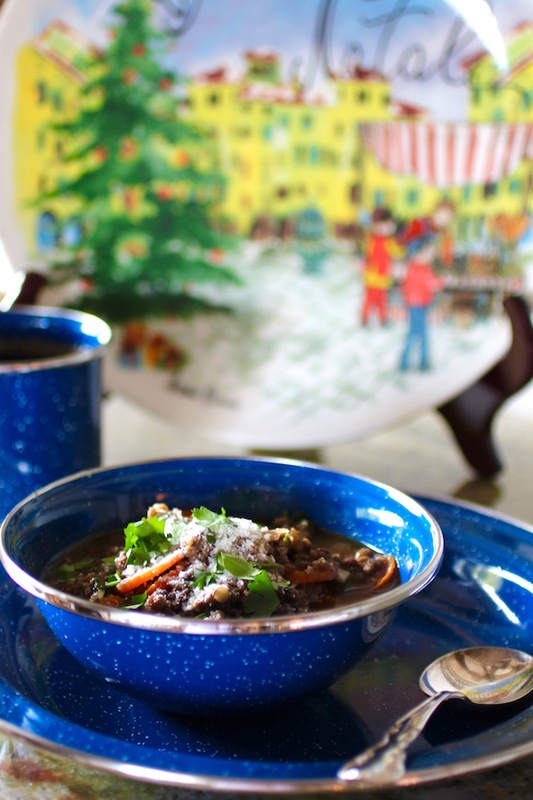 Chase away those winter blues with a hearty healthy cold-weather soup. Quick and easy preparation plus wholesome ingredients make this soup a shining star. And as a bonus, eating lentils in the new year is said to bring luck and prosperity. 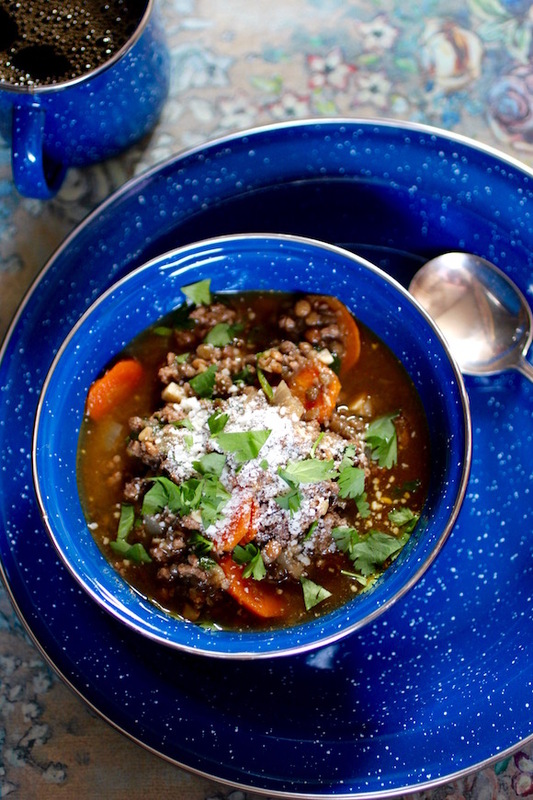 This lentil soup is a bit different from the traditional, as ground beef, French lentils, and carrots share the stage equally. 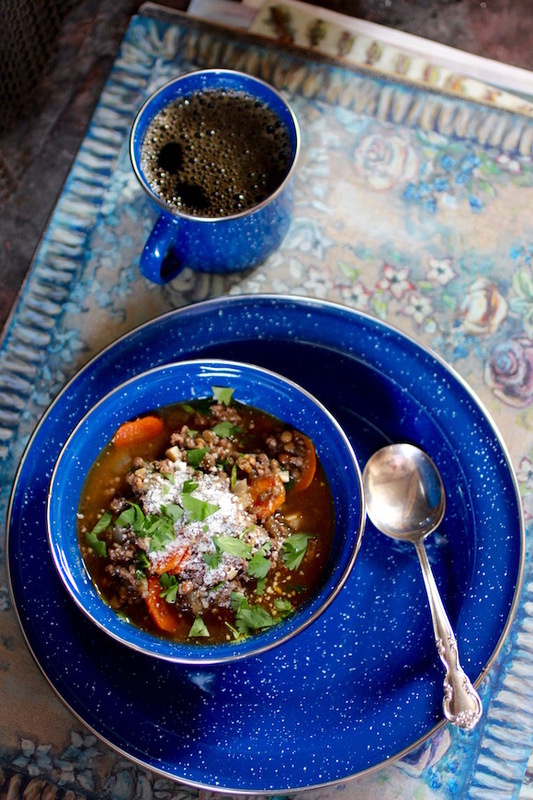 A drizzle of sherry vinegar adds that bright sharp counter-balance to the rich soup and earthy lentils. Cilantro brings fresh herbal notes while cumin and chile powder add warm spice overtones. A generous dusting of grated Parmesan adds the nutty components. This simple, humble soup actually has a complex flavor profile. Heat oil in a soup pot. Add onion and cook until soft. Add garlic and cook until lightly golden. Then add the carrots, cumin, chile powder, and beef stock. Bring to a simmer. 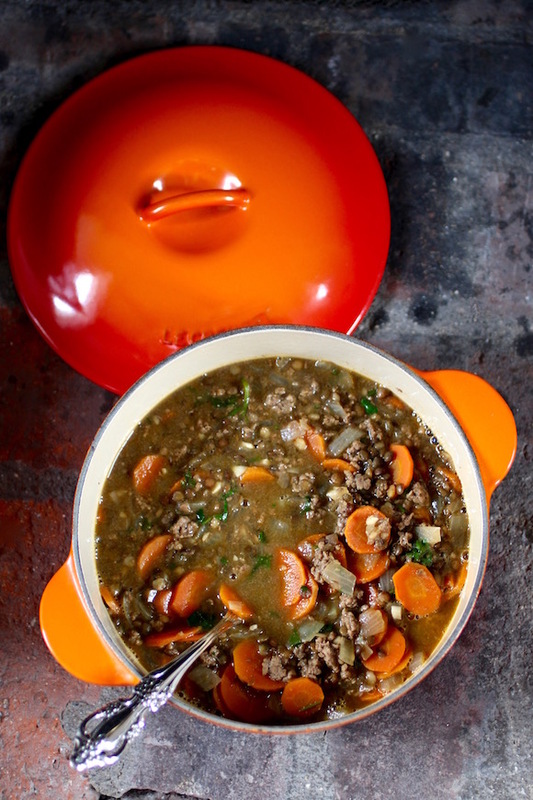 When carrots are al dente, add beef and cooked lentils. Simmer for another 10 minutes. Add cilantro, reserving some for garnish. Season to taste with salt and pepper. Place soup in warmed bowls. Drizzle with sherry vinegar, dust with Parmesan, garnish with cilantro. #ComfortFoodFeast is a season long franchise where Food Network editors team up with bloggers to share recipes about everyone’s favorite comfort foods. This week’s comfort food is soup. You might enjoy taking a peek at other soup recipes from some fabulous bloggers below… and be sure to follow our very popular Pinterest Board with over 370,000 followers called Let’s Pull Up A Chair!